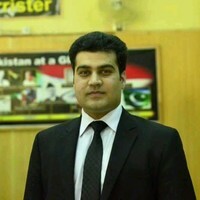 Member, Peshawar High Court Bar Association. Student member of Society of Lincoln’s Inn. Successfully defended Turkish Airlines and Emirates Airlines in 50 Million damages suits. Successfully represented before the Peshawar High Court in Appointment of sexual harassment Ombudsman of KP. Low cost medical examination and treatment of Dengue Patients in public as well as private sector hospitals and laboratories of KP. Writ Petition against the Health Department, Khyber Pakhtunkhwa to come up with a strategy to eliminate and control growing population of Rats in Peshawar in collaboration with Pakistan Medical Association. Writ Petition against the Government of Khyber Pakhtunkhwa to discourage begging children in streets of Peshawar and Child Labor and to provide them Free Education and shelter to protect them from exposure to Sexual harassment and their misuse in illegal activities. Writ Petition against the Khyber Pakhtunkhwa Government to induct Dope Test of Parliamentarians. Writ Petition against Public and Private sector hospitals for not following the SOPs provided under waste management rules, 2005 for not properly handling, storage and disposal of medical waste. Lawyers Movement & Favour of judges. Published in (The Frontier Post & The Lahore Times ). Judges Rule Through Judgments. Published in (The Frontier Post & The Lahore Times ). High Court Jurisdiction to Tribal Areas. Published in (The Frontier Post & The Lahore Times ). Law of Divorce & Khula in Pakistan. Published in ( The Third Reporter & The Lahore Times ). Dual Nationality and Election in Pakistan. Published in ( The Lahore Times ).